As part of our junior high "Career Exploration 101" elective, we are looking for people to come to SMS during it's class time (Wednesday's, 12:55-1:30pm or Friday's, 12:55-1:40pm) to share information about their career. If you are interested in coming to SMS to speak about your career, please email Liz Davis at edavis@stmonica.school. The SMS 2019-2020 academic calendar has been finalized. This calendar was worked on by a committee and feedback was provided by all teachers. We feel really good about the flow of the year and how this will positively impact student learning. One other major change that is not reflected on this calendar is that we have eliminated our Wednesday early release days. By doing this we are gaining instructional minutes that will have a direct impact on student learning. It also adds to a more consistent calendar. As a staff we will imbed meeting times after school hours and during our half day early release days. 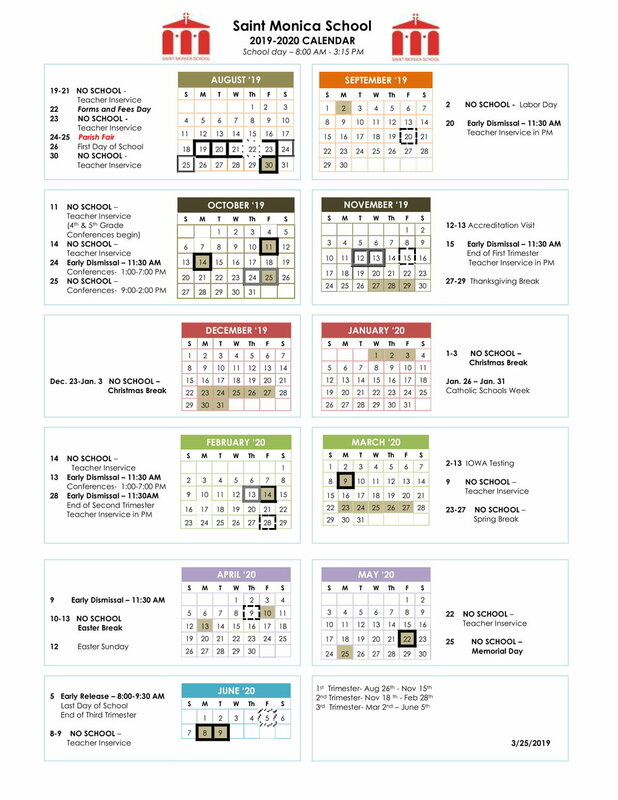 A printable copy of our 2019-2020 academic calendar can be found via clicking HERE! Forms & Fees Day will take place on Thursday, August 22, 2019 from 4-7pm in Donovan Hall. PLEASE NOTE that the time has moved to the later afternoon/evening. Since the majority of our forms have been added to TADS, this day will be less about filling out your folder of forms and more focused on finding out who your child’s teacher is, dropping off school supplies, taking individual school pictures, purchasing spirit wear/gym uniforms and signing up for lunch duty. There will also be other representatives from programs offered to SMS. We are excited about these new changes and hope it creates a more enjoyable & exciting Forms & Fees Day for your family. If you do have any questions about this day, please feel free to contact Kelly Balthasar or Connie Place (next year’s H&S Co-Presidents). 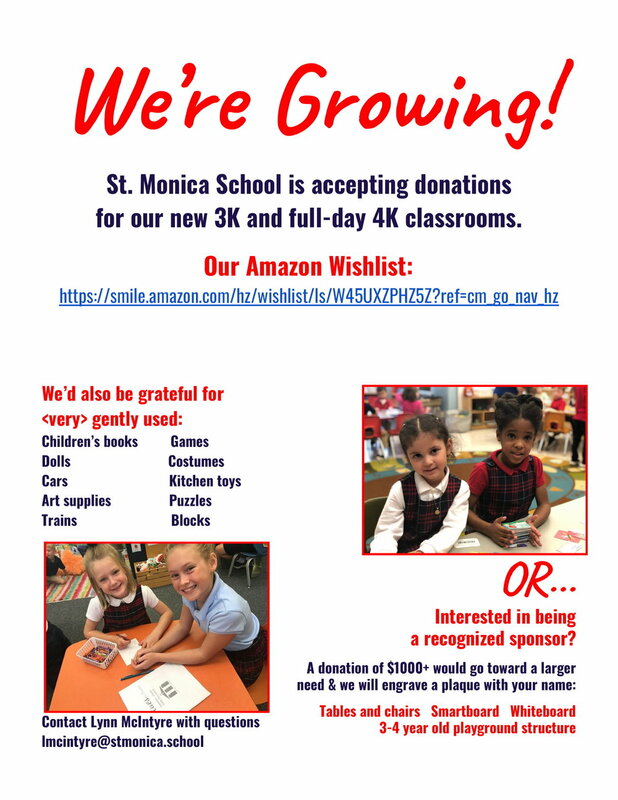 With Genius School Supply closing their doors, St Monica’s had to choose another company to assist with school supplies. The company we have chosen to go with is 1st Day School Supplies. For the past couple of months teachers have been reviewing and finalizing their school supply lists for the upcoming school year, and in turn, 1st Day School Supplies has put those lists online, into kits, for families to purchase. School supply lists are now live for St Monica School, and can be found at: 1st Day School Supplies St Monica Lists. The deadline to purchase your kit is June 30, 2019, and kits will be sent to student’s home address. We hope everyone had a great weekend. What an amazing Variety Show last Friday night! We would like to offer our tremendous gratitude to our hard-working 8th graders as well as four very special people who made the show a complete success ~ Ms. Emma Gillette and Mrs. Sara Cervelli, our wonderful music directors, and Bridie Mooney and Jen Deslongchamps, our parent co-chairs and co-directors of the show. All of you did an amazing job and we so appreciate all of your hard work on the show! Please take the time to look at the Signup.com form, which was emailed to you last week from Kelly Balthasar and Connie Place, our incoming Home and School Co-Presidents for the 2019-2020 school year. They have spent a great deal of time fine-tuning the various volunteer positions and have provided detailed descriptions of what each such job entails. We expect that each family will sign up for at least two (2) school-related volunteer positions next year. In addition, a separate sign up link will be sent concerning the auction in the near future. There are jobs of all shapes and sizes – it is a great way to get involved with school and to meet other parents. Feel free to contact us, Kelly or Connie if you have any questions. There is so much to share in regards to Athletics and Physical Education, so let’s get things rolling…. ….Literally, rolling! We will be starting the bowling unit this week for all grade levels. You will find a certificate for a free game for each of your children in today’s weekly folder, so I would encourage you to go out to bowl as a family in the coming weeks. Please remember that track practice is in its second week, and the practices will take place on Mondays and Thursdays right after school. Can you please let me know if your son/daughter will be taking part on the team this spring, and I can let Coach Gonzales know who to expect. He also does all of the communicating about meets, practices, etc., so I will share your e-mail address with him. Looking forward to a super spring season!! Our April meeting of Donuts & Devotions will take place on Wednesday the 17th at 7:30am. 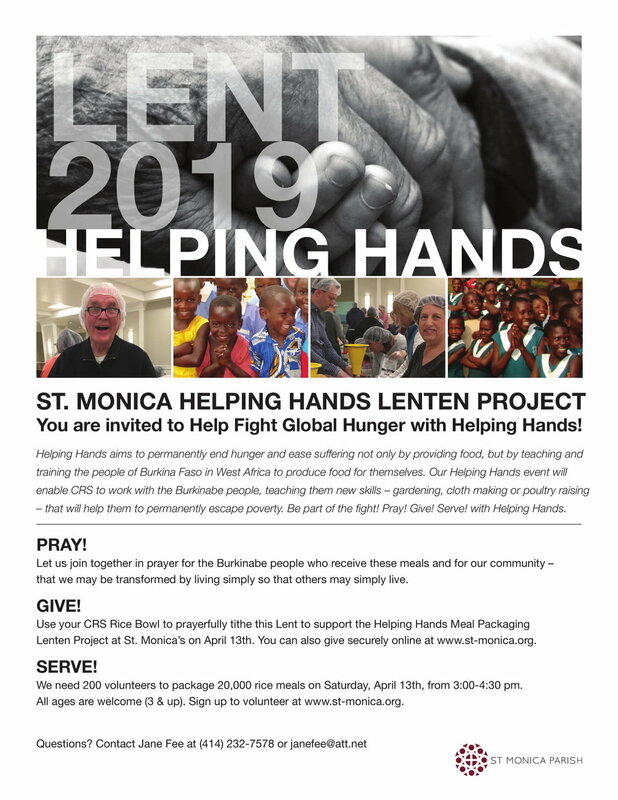 This will be a great opportunity with Holy Week and all that we celebrate as we move through Lent toward Easter Sunday. I will send out an e-mail to RSVP next week, but I wanted to get it on your calendars. The final Donuts & Devotions will take place on Wednesday, May 15th. 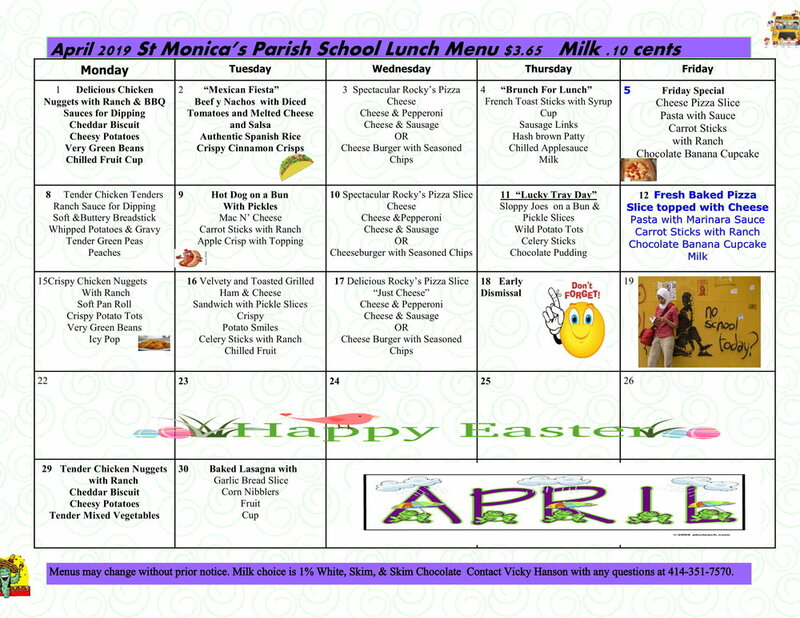 Finally, I would invite you to join the entire St. Monica community for the 72nd Annual St. Monica Sports Night on Thursday, April 11th. As is our tradition with this event, we will have a great auction, including autographed items and sports tickets, and will honor the 2018-2019 8th grade student-athletes. I am thrilled to share that the following auction items will be available on Thursday evening: an autographed Giannis jersey, an autographed Robin Yount jersey, and a Brewer VIP package that includes 4 game tickets and the opportunity to watch batting practice and visit the TV broadcast booth during the game….and more auction surprises on the way!! The funds raised at Sports Night help in supporting the athletics program at St. Monica School, including the new resurfacing, painting, and coating the gym floor from this past summer, and new bleachers and outdoor basketball hoops this year. Our guest speaker will be Joe Sherburne, former St. Monica student and University of Maryland, Baltimore County Division I basketball player. Joe will have stories to share about his college basketball experience, his team's run in the NCAA Tournament last season, and his balancing of athletics and academics as a disciplined student-athlete, which will be followed by Q&A time with him after he speaks. The doors will open at 6:00pm, with a donation of $10 for adults and $6 for children under 12. Pizza and refreshments will be served for those in attendance. And, of course, we will have the ever-popular 3-point shooting contest where 3 lucky winners will be paired with our celebrities. This is a family friendly event, and we would encourage our parents to attend the event with their children. We hope to see you there!